The Transactional Interpretation has been subject at various times to a challenge based on a type of thought experiment first proposed by Maudlin. It has been argued by several authors that such experiments do not in fact constitute a significant problem for the transactional picture. The purpose of this work is to point out that, when the relativistic level of the interpretation is considered, Maudlin-type challenges cannot even be mounted. The key points are that the required ’slow-moving offer wave,’ taken as subject to contingent confirmation, does not exist; and also that a necessary condition for the existence of an offer in the first place is that there be absorber response; the two arise together. The latter condition, previously unnoticed, is a consequence of the Davies relativistic quantum-mechanical version of the direct-action theory. The Maudlin challenge therefore evaporates completely when the relativistic level of the theory is taken into account. The Transactional Interpretation (TI ), first proposed by John Cramer , is based on the direct-action theory of electromagnetism by Wheeler and Feynman . A relativistic extension of TI has been developed by the present author; that is based on Davies’ direct-action theory of quantum electrodynamics . Due to its possibilist ontology, that model has been termed ‘PTI'), but the important feature is its relativistic nature, which provides fur- ther clarification of the conditions for emission and absorption. Therefore, for purposes of this discussion and going forward, I will refer to that model as the Relativistic Transactional Interpretation, RTI. First, some terminology: in TI and RTI, the usual quantum state |Ψ> is called an ‘offer wave’ (OW), and the advanced response a of an absorber A is called a ‘confirmation wave’ (CW). In general, many absorbers A, B, C, …. respond to an OW, where each absorber responds to the component of the OW that reaches it. The OW component reaching an absorber X would be <x|Ψ> |x> , and it would respond with the adjoint (advanced) form <x| <Ψ|x> . The product of these two amplitudes corresponds to the final amplitude of the ‘echo’ of the CW from X at the locus of the emitter (this was shown in ) and reflects the Born Rule as a probabilistic weight of the ‘circuit’ from the emitter to absorber and back, the latter being called an incipient transaction). Meanwhile, the sum of the weighted outer products (projection operators) based on all CW responses–each representing an incipient transaction–constitutes the mixed state identified by von Neumann as result- ing from the non-unitary process of measurement (cf , Chapter 3). Thus, TI provides a physical explanation for both the Born Rule and the measurement transition from a pure to a mixed state. The additional step from the mixed state to the ‘collapse’ to just one outcome is understood in RTI as an analog of spontaneous symmetry breaking; the ‘winning’ transaction, corresponding to the outcome of the measurement, is termed an actualized transaction. The absorber that actually receives the quantum is called the receiving absorber. This is to emphasize that other absorbers participate in the process but do not end up receiving the actualized quantum. The other feature of this process, which gives it its possibilist ontology, is that the quantum entities (OW,CW, virtual quanta) are all pre-spacetime objects–Heisenbergian potentiae. Spacetime events only occur as a final result of OW/CW negotiations, resulting in collapse to an actualized transaction. Thus, the collapse is not something that happens within spacetime; rather, collapse is the process of spacetime emergence. Specifically, what emerges as a result of collapse is the emission event, the absorption event, and their connection via the exchanged quantum (see ). (This point will be relevant later on.) It is only upon actualization of the transaction that a real quantum is emitted and absorbed at the receiving absorber. Now let us briefly review the Maudlin thought experiment (, p. 200). It envisions a ‘slow-moving OW’ (assumed traveling at speed v) emitted at t = 0 in a superposition of rightward and leftward momentum states. On the right at some distance d is a fixed detector R, and positioned behind R (initially on the right) is a moveable detector L. If, after a suitable time has passed (t1 = d/v), there is no detection at R, L is quickly swung around to intercept the OW on the left, where (so the proposal goes) a left-hand CW is generated and the particle must be detected at L with certainty. Thus, this is intended to be a ‘contingent absorber experiment’ (cf. [ Kastner 2012, Chapter 5]: it is assumed that the existence of a confirmation from the left- hand side is contingent on the transaction between the source and R failing. Maudlin’s intent was to provide a counterexample to the picture provided in , in which there are well-defined OW/CW matchups for all possible detection sites. The challenge presented for the original TI was twofold: (i) the probability of 1/2 for the leftward transaction was thought to be inconsistent with the fact that whenever the left-hand CW was present, that transaction would always be actualized; and (ii) the situation at t = 0 appeared ill- defined, since (if the CW is really contingent as imagined) it is uncertain whether or not the (backward-evolving) CW will be emitted from the left. Both these concerns have been addressed and resolved elsewhere (cf. , , Chapter 5). However, these responses assumed that the Maudlin experiment could in-principle be carried out. The purpose of this paper is to observe that in fact this is not the case; no such experiment can actually be done, and therefore the challenge disappears. Since it has been shown that any quantized field theory can be re-expressed as a direct action theory , RTI takes all such field excitations as offer waves. That is, any field for which the basic Davies model holds is a component of the transactional model, and transfers of real quanta of those fields can be understood as the result of actualized transactions. However, transactions occur in different ways depending on whether the filed is a source of other fields. This issue will be explored in what follows. In addition, this model has intrinsic restrictions on what sorts of ‘particles’ constitute offer waves. That is, some objects describable as quantum systems, such as atoms, do not constitute offer waves, in that they are not excitations of a specific quantum field–instead, they are bound states . On the other hand, some types of offer waves participate in actualized transactions indirectly, through confirmations of the products of their interactions, rather than by generating confirmations themselves. This work discusses both these situations, and then applies the findings to the Maudlin challenge to see why it cannot be mounted. First, as indicated above, the ‘offer wave’ concept refers to the excited states of a quantum field. A specific example would be a one-photon Fock state of of momentum k , |k>; another would be a photon coherent state |α> , which is a superposition of Fock states. On the other hand, if the system at hand is not a specific field excitation of this sort, even though it may still be described by an effective quantum state, it is not an offer wave. It therefore does not generate a corresponding confirmation wave. As noted above, an example of such a system would be an atom, which is a bound state of several different quantum fields as opposed to an excitation of a single quantum field. At this point the relevance for the Maudlin challenge is already evident: the latter proposes a ‘slow-moving quantum’ subject to contingent absorption. The ‘slow-moving quantum’ cannot be anything other than a field excitation for a quantum with nonvanishing mass if it is to constitute an offer wave, so an atom cannot instantiate the experiment. In any case, in the possibilist ontology, OW do not propagate within spacetime at subluminal speeds: they are phase waves, as opposed to group waves. It is only the actualized quantum that propagates at the subluminal group wave velocity– that in itself nullifies the Maudlin challenge. But suppose we overlook that point for now (since someone might not accept the possibilist ontology). In order to obtain an offer corresponding to a subluminal quantum, one must use a matter field, such as the Dirac field. The latter will be a source of bosonic fields, which brings us to the second important point: the asymmetry between field sources and their generated fields gives rise to a situation in which a field source participates in transactions only indirectly, by way of its emitted field. Due to this asymmetry, not all offer waves generate their own confirmations when participating in transactions. Fermionic field sources participate in transactions indirectly, by way of confirmations of the fields of which they are a source. Thus, when a Dirac field quantum such as an electron is detected, that detection is always indirect, by way of its interaction with the electromagnetic field. For example, an electron OW emits a photon offer wave, which is confirmed by another charged source field (typically an electron) in the detector. Assuming that particular photon OW and its CW ‘win the transaction roulette’ and result in an actualized transaction, the associated outgoing electron OW component is actualized as well (as a participant in particular emission/absorption events), even though it itself was not confirmed (see Figure 2). The asymmetry between the fermionic field source (the electron E) and its emitted/absorbed fields (the photon lines) is again evident here in that it is an electron propagator that connects to two interaction vertices. This allows the electron E to be indirectly confirmed and actualized via its interaction with the electromagnetic field. (The doubled photon lines indicate that a CW is generated.) Thus, upon detection of the emitted photon by D, the electron E is actualized without ever having generated its own confirmation. The other new and important feature of the relativistic development of TI (PTI) is that no offer—i.e. quantum state |Ψ> —will emitted in the first place without the basic direct connection (i.e., the time-symmetric field correlation or direct-action propagator) between the potentially emitting system and at least one potentially absorbing system (for details, see ). That means that one must have a basic interaction with at least one absorber in order to have an offer at all; such an interaction is a necessary, but not sufficient, condition for an offer to be emitted. The sufficient condition for an offer to be emitted is that a confirmation also exist. Thus, there is no such thing as an isolated OW. This may seem surprising, but it is because the offer corresponds to a real photon as opposed to a virtual photon (propagator). The only way one can have a real photon in the direct action picture is as a result of absorber response (this is discussed in  and implicitly in Davies ). 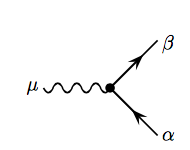 The real photon corresponds to the pole in the Feynman propagator, which is only present when there is absorber response (in general, more than one absorber will respond). The pole is what corresponds to a Fock space state |k> ; i.e., an offer wave. Thus, to get an offer, one always has to have absorber response. This means that the picture of a sequence of stages in which there is first an OW and then one or more CW is not really accurate at the fully relativistic level (which is the level at which Nature really operates). Moreover, since there has been absorber response (usually from many absorbers), technically the correct description of the real photon is the density operator (weighted set of projection operators) corresponding to von Neumann’s ‘Process 1’ (measurement transition). It is only when we consider the emission process by itself, without taking into account that it only occurs because of absorber response, that we label the emission by a ket |Ψ>, thinking of it as an independent entity (as in the Maudlin experiment). But it is not. In the direct-action theory, the ket is only a partial description of the process. So it is simply not accurate in the direct-action picture to view an offer as something that is independently emitted; rather, emission is always a two-way process, with the absorber crucially participating in any emission. Interestingly, this understanding of the real photon as an OW/CW interaction (which remained unclear in ) removes the need to impose the ‘light tight box’ condition, which seemed ad hoc. Once we understand that no real photon offer is ever emitted in the first place without absorber participation, we don’t have to impose ‘complete absorption’ as a separate cosmological boundary condition. Returning now specifically to the Maudlin experiment: in order for the ‘slow- moving quantum’ to be considered an offer, it would have to be a non-composite matter field excitation of some sort, such as an electron state | φ >. The latter is a source of a bosonic field (the electromagnetic field), which is the mediator of electron detection, as described above. * Recall that a free electron can neither emit nor absorb a real photon offer wave (due to energy conservation). Thus, an electron subject to detection is always liberated from some bound state (by absorbing electromagnetic energy) and detected via its becoming part of a new bound state (by emitting electromagnetic energy), not through being confirmed by a matching ‘electron confirmation.’ For the latter would mean that it was a free electron. To see this, refer again to Figure 2. On the incoming side on the left, a photon offer (wavy line) emitted from another charged current (labelled S) is absorbed by the electron offer E, which is thereby liberated from its initial bound state. Meanwhile, at the outgoing side, E emits another photon offer. The latter is confirmed by a charged current D in the detec- tor, the confirmation propagating back through the electron propagator and actualizing the absorbed photon that liberates E (which is why both photon lines are doubled). The actualization of the emissions and absorptions of both photons actualizes E as an emitter/absorber, since (recall from Section 1) all actualized transactions actualize three things: the emission event, the absorption event, and the transferred quantum. Finally, the outgoing current E becomes incorporated into another bound state (such as a conduction band in a metal) rather than prompting its own confirmation. None of these processes can occur without confirmation of the photon OWs, since (as discussed in the previous section) a necessary condition for a photon OW to exist at all is that a matching CW be generated. So suppose we tried to do the Maudlin experiment with a slow-moving electron state. The electron would have to be actualized by a photon offer/ confirmation. We could arrange for the electron emission to be in a superposition of rightward and leftward directions, but in order to it to be liberated at all, real energy would have to be supplied. This means a real photon. The only way you get a real photon is through absorber response–otherwise you don’t get the pole in the Feynman propagator corresponding to a Fock space state, i.e., the ket that you need for a photon offer wave. So the entire process presupposes absorber response in order for the electron ever to be emitted at all. You simply don’t get the electron offer without the photon transaction, which includes a photon confirmation. So the situation involving a contingent confirmation never exists; there are always photon confirmations for any offers in play, even if those offers are states of a fermionic matter field. *The weak field is a massive boson, but its range is far too short to be useful for the Maudlin experiment. These developments result in the evaporation of the Maudlin challenge, since there is no ‘slow- moving offer wave’ to begin with, unless it is a non-composite fermion such as an electron. ** In the latter case, an electron offer is actualized by way of photon OW of which it is a source. And in that process, a requirement for a photon OW in the first place is that a photon CW is also generated. Thus, even if we had a slow-moving electron OW, there would always be accompanying photon OW and CW, and there would therefore never be a contingent CW situation–i.e., never a situation in which a CW is only generated based on some prior non-detection. **Moreover, according to the possibilist ontology, all OW are phase waves, and they are pre-spacetime objects, so they are not subluminal anyway. Cramer J The Transactional Interpretation of Quantum Mechanics. Reviews of Modern Physics 58, 647-688, 1986. Feynman, R P and Wheeler, J A. “Interaction with the Absorber as the Mechanism of Radiation”, Reviews of Modern Physics, 17 157-161 (1945); and “Classical Electrodynamics in Terms of Direct Interparticle Action”, Reviews of Modern Physics 21, 425-433 (1949). Davies, PCW. “Extension of Wheeler-Feynman Quantum Theory to the Relativistic Domain I. Scattering Processes”, Phys. A: Gen. Phys. 4, 836 (1971); and “Extension of Wheeler-Feynman Quantum Theory to the Relativistic Domain II. Emission Processes”, J. Phys. A: Gen. Phys. 5, 1025-1036 (1972). Kastner R E. The Transactional Interpretation of Quantum Mechan- ics: The Reality of Possibility. Cambridge: Cambridge University Press (2012). Kastner R E. “The Emergence of Spacetime: Transactions and Causal Sets,” in Licata, (Ed. ), Beyond Peaceful Coexistence: The Emergence of Space, Time and Quantum. London: Imperial College Press (2016). Maudlin T. Quantum Nonlocality and Relativity. Oxford: Blackwell (1994). Narlikar, J. V. “On the general correspondence between field theories and the theories of direct particle interaction.” Cam. Phil. Soc. 64, 1071 (1968).